I am in Barcelona for the weekend, planning to follow the traditional Spanish cycle of prayers and liturgy from Good Friday today [25 March 2016] through to Easter Day on Sunday [27 March 2016]. This is only the third time I have been to Spain. Two years ago, in April 2014, I spent a similar weekend in La Carihuela, once a picturesque fishing village on the edges of Torremolinos. And seven years ago, in 2009, I spent the May Day holiday in Madrid. So this is my first time in Barcelona, the capital of Catalonia and Spain’s second largest city, with a population of 1.6 million, and the seventh-most populous urban area in the European Union after Paris, London, Madrid, the Ruhr area, Berlin and Milan. I arrived here earlier this morning on an early Aer Lingus flight that left Dublin at 6.40. 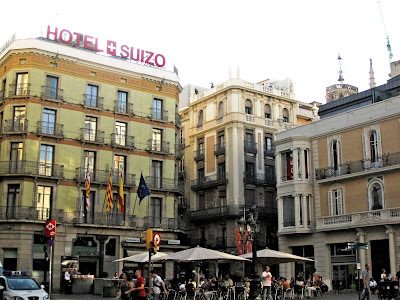 I am staying in the Hotel Suizo on Plaza del Angel in Barcelona’s Gothic Quarter, close to the Cathedral of the Holy Cross and Saint Eulalia (Catedral de la Santa Creu i Santa Eulàlia, Catedral de la Santa Cruz y Santa Eulalia), the Gothic cathedral built in the 13th to 15th centuries. I am a one-minute walk from the Jaume I subway station, a 10-minute walk from La Boqueria market and just 3 km from Antoni Gaudí’s Basilica of Sagrada Família. Barcelona is a Mediterranean city, on the coast between the mouths of the rivers Llobregat and Besòs, and bounded to the west by the Serra de Collserola mountains. Barcelona has a rich cultural heritage and is an important cultural centre and a major tourist destination. The name Barcelona comes from the ancient Iberian Barkeno, found in an inscription on an ancient coin inscription. It was known to the classical Greeks as Βαρκινών (Barkinṓn) and in Latin as Barcino, Barcilonum and Barcenona. Some writers suggest the city may have been named after the Carthaginian general Hamilcar Barca, who was supposed to have founded the city in the 3rd century BC. This was founded as a Roman city, and in the Middle Ages Barcelona became the capital of the County of Barcelona. After merging with the Kingdom of Aragon, Barcelona continued to be an important city in Aragon as an economic and administrative centre and the capital of the Principality of Catalonia. The Barri Gòtic or Gothic Quarter where I am staying is the centre of the old city. Many buildings here date from mediaeval times, some from as far back as the Roman settlement of Barcelona. 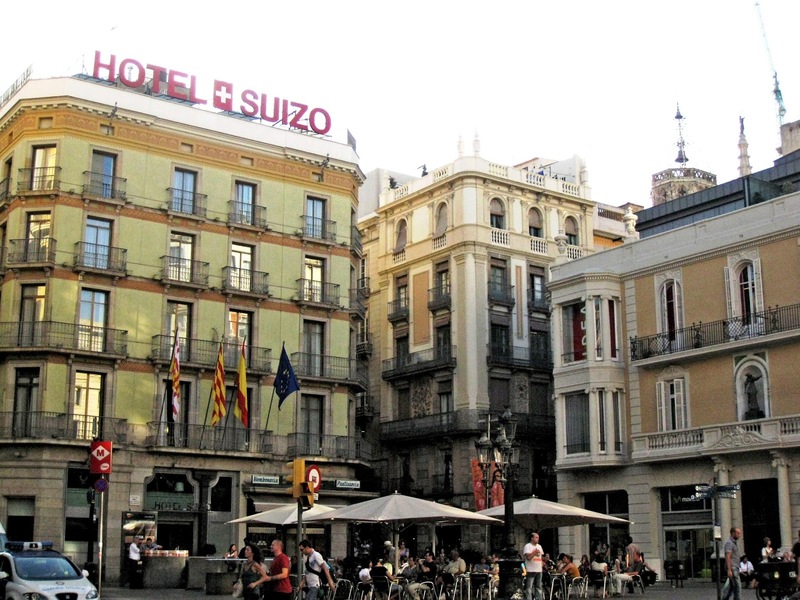 Catalan modernista architecture – related to the Art Nouveau movement in the rest of Europe – developed between 1885 and 1950 and left an important legacy in Barcelona. Several of the buildings in Barcelona have been designated as part of one unique Unesco World Heritage Site. I hope to see many of the works of Gaudí throughout the city. His best-known work is the immense but still unfinished Basilica of the Sagrada Família. Building began in 1882, and this work still depends on private donations and financing. It is expected to be completed by 2026. I also hope to visit the Park Güell, in La Salut, a neighbourhood in the Gràcia district. With urbanisation in mind, Eusebi Güell asked Gaudí to design the park. The park was built in 1900-1914 and in 1984 Unesco declared the park a World Heritage Site. In his designs for Park Güell, Gaudí drew on all his architectonic genius and put into practice much of his innovative structural solutions that would become the symbol of his organic style and that would culminate in the creation of Sagrada Familia. In 1999, Barcelona won the RIBA Royal Gold Medal for its architecture, the first and only time that the winner was a city and not an individual architect. Of course there is La Rambla, there is FC Barcelona, there are long stretches of beach in the heart of the city, there are memories of reading George Orwell’s Homage to Catalonia in my teens at school … and there are echoes of Freddie Mercury and Montserrat Caballe singing Barcelona. But first and last I am here to learn, to listen, to pray and to be liturgically aware during this holiest and most sacred of weekends.